At just 2,007 square feet our Casa did Campagna, or, Country House, is one of our largest, "small" cottages. This surprising cottage looks and feels even larger! 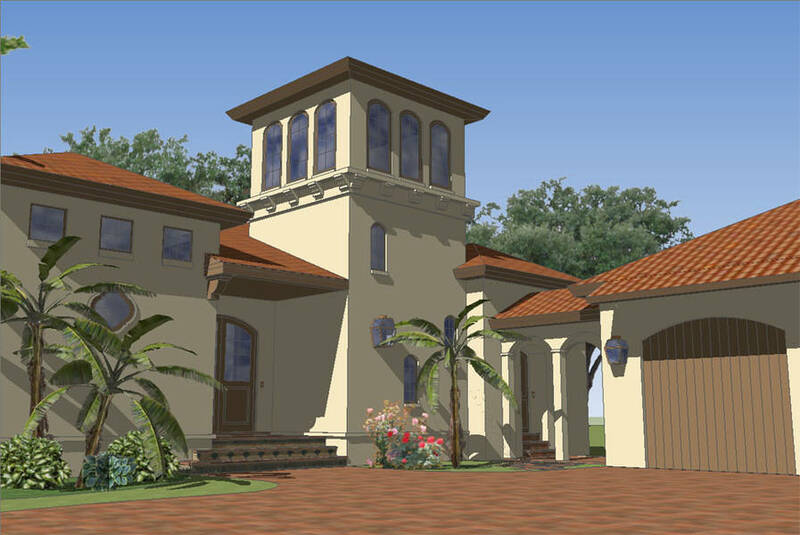 Its rambling Italian facade, familiar tower and other typically Tuscan architectural elemants such as clay tile roof, buff colored, stucco walls and graceful, tall windows echo Tuscan country style. Inside, vaulted ceilings in the great room and master bedroom add natural light and an airy dimension not often seen with small cottages. 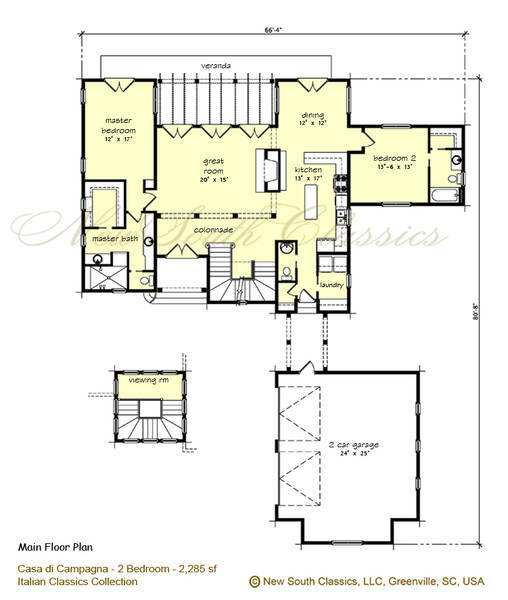 The open floor plan adds another dimension and makes this house perfect for relaxing and entertaining. All rooms enjoy tremendous views with lots of windows around a sunny, pergola topped veranda. 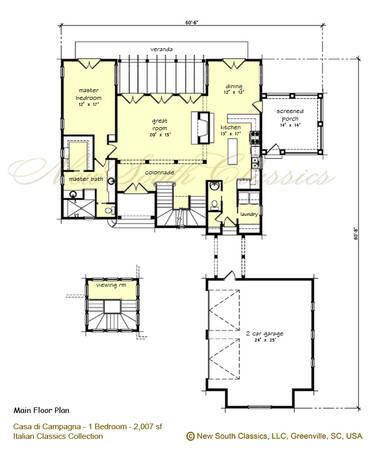 Note: This house also is designed to be able to accomodate a second bedroom addition (see below) or even a basement that allows for an additional one or two bedrooms, office, and playroom or second great room. 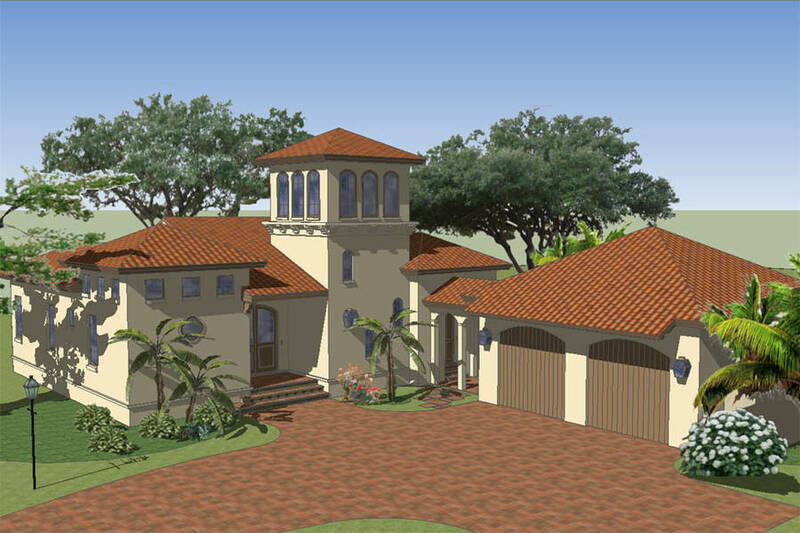 The approach to our Casa di Campagna is warm and welcoming with a linked, two car garage wrapping around the entry court. A columned breezeway allows views through to the side while gentle steps lead to an arched double door with leaded glass windows that allow a view through the house to the veranda. On entering, a columned hall opens to the vaulted great room with a wall of French doors opening to a view of the Veranda and a large fireplace at the far end. Arched openings allow circulation to the kitchen and dining areas that become a part of the great room while having enough visual separation to make spaces cozy yet open. A vaulted and beamed master bedroom suite is like a fine hotel with a luxorious bath with walk-in shower, large closet and his and her's vanities. The big surprise in the bath is the high, beamed ceiling above a clerestory that floods the bath with natural light. A screened porch off the dining room adds another element of resort style living. The biggest surprise is the Tuscan style tower that is perfect to take advantage of lake, ocean or mountain views as you sip on your morning coffee! 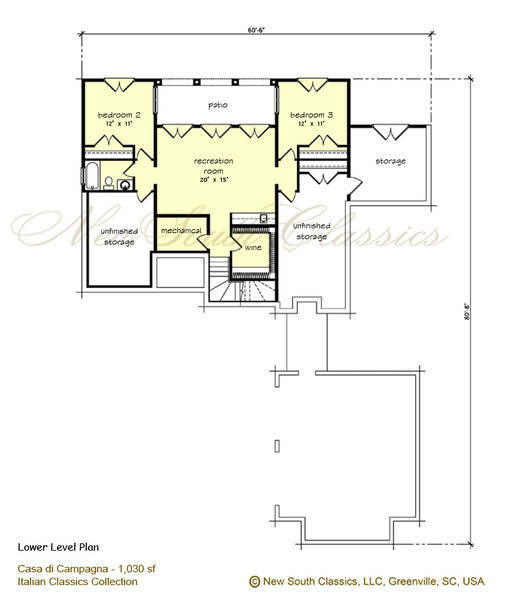 If you're looking for more space, we have a 3 bedroom version with a terrace level below. A winding stair beneath the tower opens up below on the terrace level to a great room that mirrors the one above. 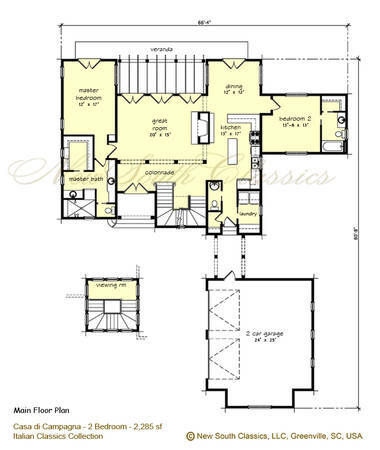 A second and third bedroom open onto the great room on opposite sides and share a full bath. Another full bath can easily be added to bedroom #3 if desired. At the foot of the stairs, an elegant wine storage area adds to the Italian charm of this surprising house! Unfinished, bonus storage space is plentiful and may be used for additional space if desired. 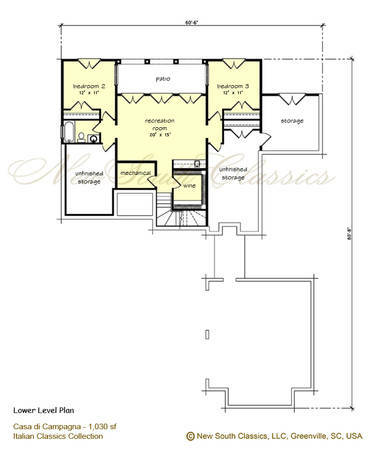 These areas lend themselves for use as a media room, office, hobby room or play areas. As above, a wall of French doors opens to the terrace, great views and a lot of natural light. In this version, a deck may be added off the great room above. 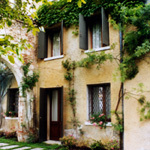 All in all, our Casa di Campagna is quite surprising for a small "large" house! Come home to a Mediterranean styled classic! See what style and comfort are available in these specially designed, smaller cottages that feel and look surprisingly large! You can convert the screened porch into a second bedroom/office on the main floor!